The name Hickling had evolved from the Saxon ‘Echelinge’ into Hikelinge by the time of the Domesday Book. The village is basically linear in layout stretching southwards at right angles to the canal, and larger than it appears from the towpath, with many attractive houses. Only the Plough Inn remains out of four which were here when the canal was in its prime. 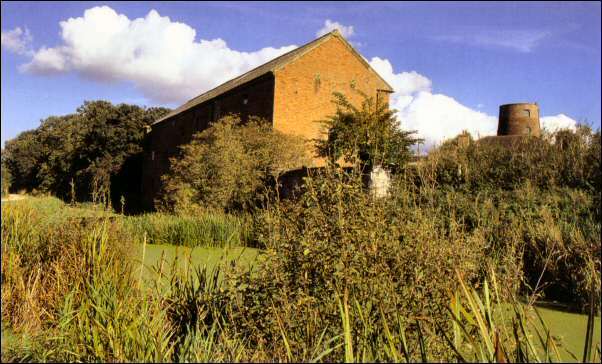 Historical interest must however centre upon St. Mary’s church, situated 250 yards from the canal basin. The building is a pleasing mixture of the old and not so old. There is a remarkable 10th century coffin lid to see and another of the 14th century is built into the wall below the west window of the south aisle. The south door is 13th century with original iron hinges and metalwork. The neat ashlar tower of 1873 contrasts markedly with the much rougher masonry of the south aisle and chancel (1845) and the weathered ironstone buttresses. Before leaving Hickling take time to study the local history information board by the basin. Look too across the water to the reflection of the old warehouse built in 1797, when the canal was opened, and now a listed building. This warehouse and the size of the basin are indicators of the former prosperity and volume of trade carried on here. The canal area was then also a focal point for many village events and up to the 1920s pleasure trips by boat were available. There is also a children’s tale of the basin being frequented at midnight by a whale – this being the only place where it could turn round. The towpath is surfaced throughout this section which is particularly rich in original buildings from the construction of the canal in 1793 to 1797. The way stretches ahead beside a half mile straight of wide, open water. Within a few yards an aqueduct over a small tributary of the River Smite is crossed and a little further on, near two handy bench seats, is an overflow weir on the south bank. Sharp bends lead to a cutting and the sudden view of Clarke’s Bridge [B32] with its name plaque underneath. This is an original structure from 1797 and it too is listed. Also note that renewed swing bridges in the vicinity anticipate restoration and future navigation. Between [B33] and [B34] is the canal feeder stream [No. 3] from the River Smite. ‘Smite’ is a common stream name and although its meaning is doubtful it is known to be of Germanic origin. The river itself is crossed by an aqueduct [B35]. You may not at first realise what it is, so watch for it carefully. It is also listed. Steps on the left allow a view right through it under the canal. The river also forms the county boundary between Nottinghamshire and Leicestershire. Next comes Long Clawson Bridge [B37]. Agile souls might just squeeze under this but it is better to follow the recognised route up to the road and cross to the hand gate and ramp in the cottage garden opposite from which the towpath resumes towards Marriott’s Bridge [B38]. A short walk brings you next to Hose Bridge [B39] where there are parking and picnic areas. It is just under half a mile detour southwards to Hose D. This is worth undertaking, and not only for the two inns, both of which were built between 150 and 200 years ago. Delightful paths thread between the curving streets, especially Church Walk leading from Middle Street and the green to the Black Horse. In the Domesday Book the village is referred to as ‘Hoches’, the plural of ‘Hoh’ – meaning ‘hill’. Archeological digs in and around the village have located several sites of medieval houses and various pottery finds. Hose Grange lies to the north of the village and was originally a monastic site, indeed the word ‘Grange’ defines an outlying monastic farmstead. To the north and east of it, the OS map still shows the location of the monk’s fishponds. St. Michael’s is divided horizontally, having a high limestone clerestory crowning a rich golden, ironstone nave. The tower too is divided, but in style, with a decorated lower stage and a perpendicular upper one carrying unusual square pinnacles. 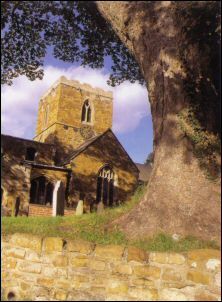 Most of the church was built in the early 14th century. On resuming the towpath, walk from Hose. This is the canal’s halfway point, that is, 16.5 miles from either Trent Lock or the Grantham canal basin. As the canal swings northeast towards Harby, notice the medieval ridge and furrow fields on the far bank. Immediately after [B40] a notice on far bank announces the ‘Hose Feeder Stream’ [No.4]. Approaching Harby Mill Bridge [B41], note the old windmill on the hillside and the 1836 granary next to it. And here too there are more original canal warehouses from the 1790s. Cross the road and continue to Langar Bridge [B43] from which, looking north, the windsock on Langar airfield is visible. The airfield was built in 1940 as a bomber station with three intersecting runways and the well known aviation firm A.V. Roe had workshops here. 207 Squadron was based here in October 1942 and they took part in the famous raid on the French Schneider factory near the Franco – Swiss border. At the end of 1946 the airfield was closed but five years later reopened as a Royal Canadian Air Force base until a second closure in 1963. It is now home to the British Parachute and Skydiving School. From this point the quarter of a mile detour into Harby village is worth doing, especially if you are ending your walk here and not going on to another section. The Nags Head in the village has been an inn for 200 years but parts of it date from the 14th century when the building was a monks’ dormitory.